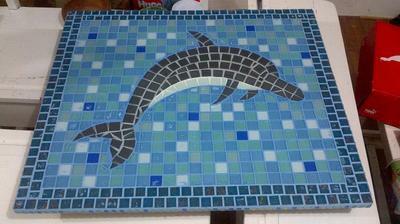 Ten weeks ago I started a mosaic tiling course in my church hall and this is one of the project we had to do - a table top with the design of an animal and I chose a dolphin. I really started the course to learn how to lay tiles but it is more than that and I enjoy doing it. So far I've done two pots, a bottle, another table (round), a mirror and a piece I would like to make into a small table.